“Here today, up and off to somewhere else tomorrow! Travel, change, interest, excitement! The whole world before you, and a horizon that's always changing!” - the wise words of Mr Toad in the Wind and the Willows. Played by Rufus Hound, his thespian talents are not his only distinguishing feature - thanks to his extraordinarily well-manicured facial fuzz. He has since teamed up with Captain Fawcett, a brand providing top quality shaving and grooming products since 2011. Thanks to the highly successful vibe they have created, it is fair to say that the range has now snowballed in both form and profits. Their website even transports you to a bygone world of Dickensian charm, but with an up to the minute interface, encouraging us chaps to lavish some attention on our personal grooming regimes. Having previously tried their Million Dollar Beard Oil (see here), and from reading up on some of Captain Fawcett’s newest adventures, we at The Amazing Blog HQ found ourselves researching for 3-piece tweeds, pipes and baccy…and none of us smoke! 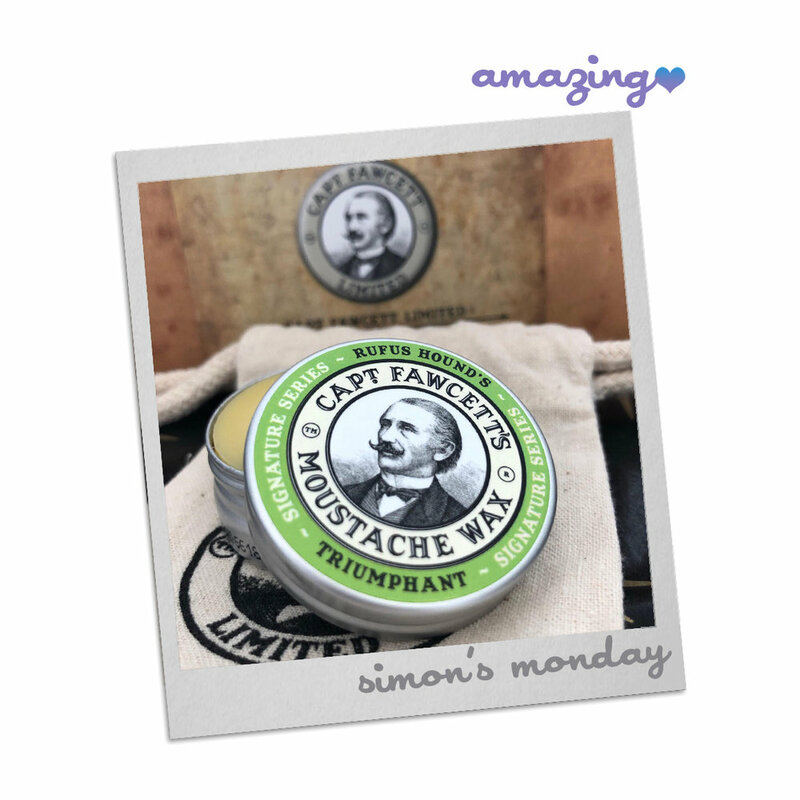 Back to the point, and more importantly, the product which our friend Rufus Hound has collaborated with Captain Fawcett on: ‘Rufus Hound’s TRIUMPHANT Moustache Wax’. Part of the Signature Series, where ‘The Captain’ has teamed up with a string of perfectly coiffed hirsute faces (literally), we were keen to see what Mr Hound’s tin would provide. Fragrance-wise we have a delicious recipe on offer - there’s bergamot, lime and ylang ylang, with blackcurrant, clove and galbanum. If that’s not enough, then this wax also has earthy notes of sandalwood, ambergris and musk, producing a richl and indulgent pong that sits well on the top lip area. The 15ml tin may be small, but a little goes a long way If you too believe a ‘tache should be primped ’n perky, £12 is a small price to pay. Be warned though, appropriate application is definitely required for the perfect result - use just the flicker of a fingernail amount and ensure it is warmed thoroughly to achieve an even spread throughout. The hold is firm, and once you have styled your moustache, you can be sure that your creation will stay in place for the day. Available through the Captain Fawcett website for £12 (15ml), you’ll also find a plethora of other goodies to investigate, including information, advice, and updates on The Captain’s latest adventures!